The viticultural effects of sward competition with vines for water and nutrients, indirectly resulting from reduced herbicide use under a sustainable production system, are well established in cooler, more humid areas but are less well understood in warm and dry areas. Three groundcover treatments—standard industry practice of herbicide-treated undervine strips, bare soil maintained with herbicides, and complete floor cover (no herbicides)—were applied in two Chardonnay vineyards, one in a hot dry climate, the other in a mild climate. Increasing floor cover decreased early-season soil moisture and petiole nutrient status and strongly reduced vine vegetative growth. After three experimental years, grape yield also became limited. Large treatment differences in vegetative growth, canopy structure, and yield contributed to differences in berry weight and composition. Vine response to floor covers was less pronounced under mild climatic conditions compared to hot and dry conditions. Total or partial floor cover is a powerful tool for controlling vegetative growth of grapevines. However, under hot and dry conditions, competition for water and nutrients, particularly if it occurs at sensitive stages (such as bloom and berry set) can lead to a substantial decrease in yield and vine capacity. In Australian vineyards, weeds have traditionally been controlled by using repeated cultivation in combination with herbicides. However, long-term problems with herbicide use include accumulation in the soil, which can damage vine roots, contaminate irrigation dams through surface runoff, and leach into groundwater (Lennartz et al. 1997). Moreover, the appearance of herbicide resistance in target weeds is a threat to weed control. For example, glyphosate-resistant Lolium rigidum has been found in Australian vineyards and orchards (Powles et al. 1998). Weed-free vineyards may lead to increased insect pest problems, since they are essentially high-input monocultures characterized by a lack of stability because of their inherent ecological simplicity (Tedders 1983). Maintaining complex ecosystems requires adopting and optimizing sustainable production techniques and cultural practices that form a part of an integrated management system. Reducing chemical inputs is an essential first step, which is linked to integrated pest and disease management, closed nutrient cycles, and management of stable and diverse agro-ecosystems (Boller and Remund 1986). To bring vineyards closer to natural conditions, the Swiss model of integrated production (IP), developed at the Federal Research Station in Wädenswil, stresses the desirability of high biodiversity, sustained soil fertility, optimal growing conditions, and minimal unintended environmental side effects while maintaining cost-effectiveness. Vineyard floor management is an integral component of IP, various versions of which are being implemented across Europe, North America, South Africa, and New Zealand. The IP model was designed primarily for environmental reasons, but maintaining sward under vines has produced conflicting results when it comes to vine behavior. Research in California has demonstrated that floor covers can improve water infiltration in poorly structured soils (Gulick et al. 1994). Improved soil structure, higher soil organic matter, and higher biological activity also increase soil water-holding capacity (Pinamonti et al. 1996) and reduce herbicide persistence and leaching. Permanent vineyard cover crops or swards have been examined on a variety of soils and climates across Europe, including light-textured soils in dry regions. Sward-vine competition reduced vine vigor and yield in cool, dry parts of Germany so much that, in the 1950s, cover crops were abandoned in dryland vineyards as unsustainable (Homrighausen 1990, cited in Schultz and Löhnertz 2002). Similarly, in South Africa permanent grass cover was found to be detrimental because of severe transpiration losses in Chenin blanc vines (van Huyssteen and Weber 1980a). Grape quality was improved by using a permanent floor cover in the dry summers of Montalcino, Italy (Ferrini et al. 1996). Conversely, cover crops were associated with off-flavor development in white wines in Germany, presumably via a lack of nitrogen and water arising from sward-vine competition (Schultz and Löhnertz 2002). Thus, creating an environmentally sustainable viticultural production system raises the issue of sward-vine interaction, which is an indirect result of reducing herbicide use and soil cultivation. Appropriate floor-management practices are vital for successful implementation of sustainable production systems (Pimentel et al. 1992). There is ample experience in switching from conventional to sustainable floor-management practices in mild and humid climatic conditions, but less so in warm and dry conditions commonly found in Australia. This paper examines sward-vine interactions on irrigated Chardonnay grapevines and how these treatments compare between hot-dry and mild semihumid climatic conditions. Results show that a permanent vineyard sward causes a striking decrease in Chardonnay vigor and yield in the hot and dry climate compared with a mild and semihumid climate. Three distinct floor cover treatments were applied in two drip-irrigated Vitis vinifera L. cv. Chardonnay vineyards located in climatically distinct grapegrowing regions in New South Wales. The Wagga Wagga (WW) vineyard site (147°20′57′E; −35°03′06′S; elevation 239 m) is in a hot and semiarid area (mean January temperature 24.0°C, 2050 growing degree days >10°C and 304 mm rainfall over the Oct to April season). Tumbarumba (TR) (148°00′44′E; −35°46′41′S; elevation 645 m) has a mild and semihumid climate (20.1°C, 1318 growing degree days and 492 mm rainfall from Oct to April). Own-rooted Chardonnay vines were planted in 1997 at WW and in 1989 at TR, with 3 m between rows and 2 m between vines. Row direction was E-W at the WW site and NE-SW at TR. At both sites, vines were cordon-trained and spur-pruned (to ~25 buds/vine) by hand. Soil at the WW site was shallow (~30 cm topsoil, variable across the vineyard) and consisted of coarse sandy loam overlaying hard-to-penetrate subsoil of granite saprolite. The TR vineyard had a shallow A horizon of silty clay loam over a deeper (up to 90 cm) B horizon of light clay. The vines in each vineyard were irrigated with the same amount of water across all treatments and fertilized according to the standard practice applied by respective vineyard management teams. Water meters were installed at the WW trial site, and they recorded a seasonal (Oct to April) irrigation amount of 1.73, 1.65, and 1.93 mL/ha for the 2002/03, 2003/04, and 2004/05 seasons, respectively. Water meters were installed at TR only in the 2004/05 season. Vineyards in TR are normally not as dependent on irrigation as those in WW, and the recorded seasonal amount of irrigation was only 0.46 mL/ha. The irrigation strategy was determined by vineyard management at each site and the information driving these decisions was not made available. Seasonal weather conditions varied over the experimental period (Figure 1⇓). The 2002/03 season, with less than one-third of normal rainfall over the Oct to April period, stands out as extremely dry and hot. Bare: completely bare soil, maintained by repeated application of systemic herbicides. Partial: partially covered soil, using standard ground cover of permanent resident vegetation between rows with a regular mowing regime. The sward was mowed about 3 to 4 times per season (mostly during spring), based on visual inspection of sward growth. Most resident vegetation was summer-dormant, particularly in WW. A 100-cm-wide strip under vines was kept weedfree by herbicide application. Complete: completely covered soil, using permanent resident vegetation with a regular mowing regime (as above) and no herbicide application. The area under vines was mown with a hand-operated lawn trimmer. These treatments were applied in the growing seasons 2001/02 through to 2004/05. In 2001/02 treatments were applied only at WW, while the remaining three seasons included both sites. Experimental treatments were arranged in a randomized block design with 12 replicate plots. Each replicate plot consisted of five vines used for data collection at WW and four vines at TR. Plots with complete floor cover were connected via 3-m-wide corridors to ensure a contiguous ecosystem for unimpeded movement of arthropods. (Results on botanical, arthropod, and microbial diversity will be presented elsewhere.) Groundcover treatments were applied on 8-m plots of four adjacent midrows, using the vines in the center row for data collection. To facilitate data collection, the number of plots observed was reduced for selected variables to four replicates per treatment. Trial design was different in 2001/02, having the same floor-cover treatments, but with four 20-m replicate plots per treatment, each consisting of six adjacent midrows. Soil water content was monitored in 2003/04 and 2004/05, using neutron probes in each plot in four different positions (underneath the irrigation drip-emitter, immediately adjacent to the vine, at ~50 cm from the vine row into the alley and in the center of the alley). These neutron probe access tubes enabled measurements of volumetric soil moisture content at depths of 20, 30, 40, 50, 70, 90, and 110 cm. Gravimetric soil moisture content in winter (July 2004) was determined from soil samples collected from 10- to 15-cm depth from selected plots. Samples were dried in an oven at 100°C until constant weight. Soil moisture tension was recorded using gypsum blocks (G-Bug System, Measurement Engineering Australia, Magill, South Australia). Three gypsum blocks were positioned around the irrigation-line dripper at depths of 20, 50, 70, and 100 cm. One gypsum block was located near the vine at 50-cm depth, two at ~50 cm from the vine row into the alley, and the last one in the center of the alley, both last gypsum blocks at depths of 50 cm. This setup was replicated 12 times across the trial site at WW (with a total of four replicates in each of the three treatments) and 9 times at TR (having three replicates of each treatment). A simpler setup was located at TR from Oct 2002 to March 2004, with only one replicate per treatment. Soil samples were collected from selected plots, both from undervine and midrow positions, from the 0- to 10-cm layer in July 2002, Aug 2003, and Dec 2004. Samples were collected from the 0- to 10-cm layer, as the floor-cover treatments were expected to show the greatest effect over time in the topsoil. In Dec 2004, soil samples were also collected from the 40- to 50-cm layer. Soil samples were sent to the Pivotec Laboratory (Werribee, Victoria) for analysis of major nutrients. Organic carbon was determined by dichromate oxidation and titration. Also determined were CEC total, Al, Ca, Na, Mg, K (0.1 M NH4Cl/0.1 M BaCl2); Zn, Mn, and Fe extracted in DTPA, CaCl2.2H20, triehanolamine, ICP-AES); K (1 M HNO3 at 100°C, ICP-AES); Mn (DTPA, CaCl2.2H2O, triehanolamine, ICP-AES); total N (Kjeldahl digestion); nitrate (1 M KCl); total P (Kjeldahl digestion); available phosphate (Colwell); pH (water); pH (CaCl2) and available S (0.01 M CaHPO4). To determine plant nutrient status, 25 petioles were collected from each experimental plot (a total of 36 samples per site) from nodes opposite an inflorescence or cluster at bloom (2003/04 and 2004/05) and veraison (2002/03 and 2003/04). They were analyzed at Waite Analytical Services (Adelaide, SA) for macro- and micronutrients by inductively coupled plasma atomic emission spectrometry. Viticultural performance of Chardonnay grapevines was assessed by measuring grape yield and cluster number per vine at harvest (all treatments were hand harvested on the same date). Average berry weight was determined at veraison, midmaturity, and at harvest using a sample of 50 berries randomly collected from each plot. Vine vegetative growth was assessed by measuring length of 10 shoots per selected plot on a weekly basis. In the 2004/05 season, three key phenological stages (budbreak, bloom, and veraison) were also monitored as described in Tesic et al. (2002), on two vines per selected plot. Phenological and shoot growth data were used to calculate average early-season vigor (daily shoot growth rate during budbreak to bloom). The weight of winter prunings was measured for each plot. The canopy point quadrate method (Smart 1988) was used at veraison to assess canopy architecture on selected plots in 2001/02, 2002/03, and 2003/04 seasons. Fresh berries were analyzed for total soluble solids (TSS) by refractometer. Titratable acidity (TA) and pH of the juice were determined from frozen grape samples using TitraLab 80 (Radiometer Copenhagen, Willich-Schiefbahn, Germany). Grape composition was determined at veraison, midmaturity, and at harvest in 2004/05 and only at harvest in other seasons. Grapes harvested from selected plots were used for small-lot vinification in 2002/03, 2003/04, and 2004/05, detailed methods and results of which will be reported in a separate publication. Statistical analysis of data was conducted using Statistica 7.1 software package (StatSoft, Tulsa, OK). Correlation and regression analysis were used to determine the relationship between selected variables and ANOVA and LSD test to determine significance of differences between treatments. Unless otherwise indicated, results with p < 0.05 were considered to be statistically significant in this experiment. Increasing floor cover led to lower soil moisture content in 2003/04 and 2004/05. Volumetric soil moisture measurements showed some extremely low values of moisture content, particularly at 30-cm soil depth at WW (Figure 2a⇓), perhaps related to the texture of the topsoil at this site, coarse sand having a very low field capacity. Soil moisture content at WW, measured at 30 cm, showed much variability, particularly when monitored under irrigation drippers and near vines. That was less obvious in the corresponding TR measurements (Figure 2b⇓), which could be related to the less frequent irrigation events at the latter site. A similar observation can be made when comparing the 30- and 90-cm soil moisture readings, which generally fluctuated less at TR than at WW, again probably because of the effect of irrigation. 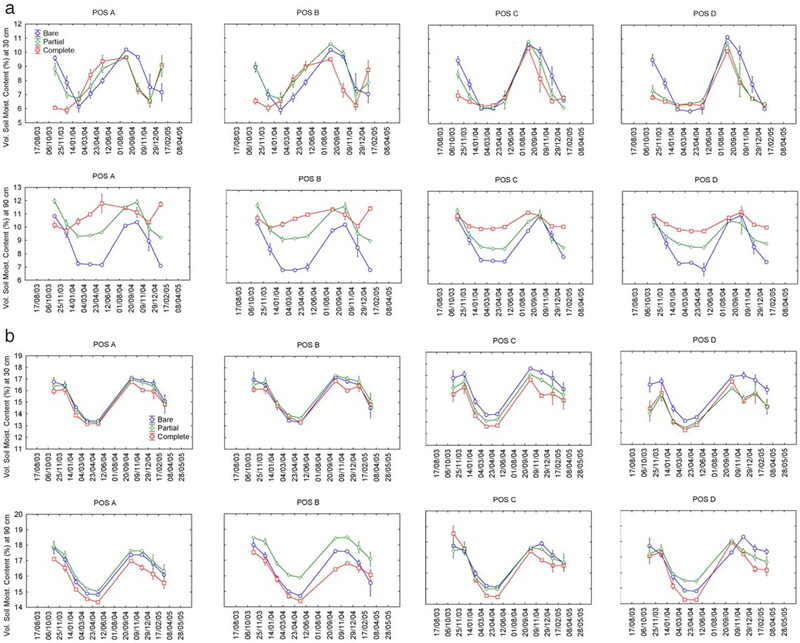 Volumetric soil moisture content measured at 30- and 90-cm depth from 05/11/03 to 28/01/05 at Wagga Wagga (a) and from 14/11/03 to 25/01/05 at Tumbarumba (b). Neutron probe access tubes positioned (pos) under drippers (A), vine (B), at the wheel track (C), and midrow (D). At WW, the midrow position at 30-cm depth in the complete treatment was drier in spring compared to the bare treatment. Samples from under vines (positions A and B) at this depth had increased moisture content because of drip-irrigation. In deeper layers of soil (90 cm) these differences between positions were less compared with shallower layers. At WW, the effect of treatment at 90 cm was almost opposite to that at 30 cm, as complete had considerably higher moisture content than bare. Around March 2004, at TR, the treatment differences at 90 cm were much less than at WW. Treatment differences were also opposite in direction: complete was lower in moisture content at both analyzed depths (30 and 90 cm) compared with the other treatments. The effect of floor management on soil moisture tension (average for the 2002/03, 2003/04, and 2004/05 seasons) was very strong at WW (Figure 3⇓). Measurements for complete at WW in spring and early summer indicated exceptionally dry soil conditions. Differences in mean monthly soil water tension at TR were not significant; however, at both sites there was a large variability in soil moisture tension, probably related to variable rainfall over years (Figure 1⇑) and to natural soil variability. 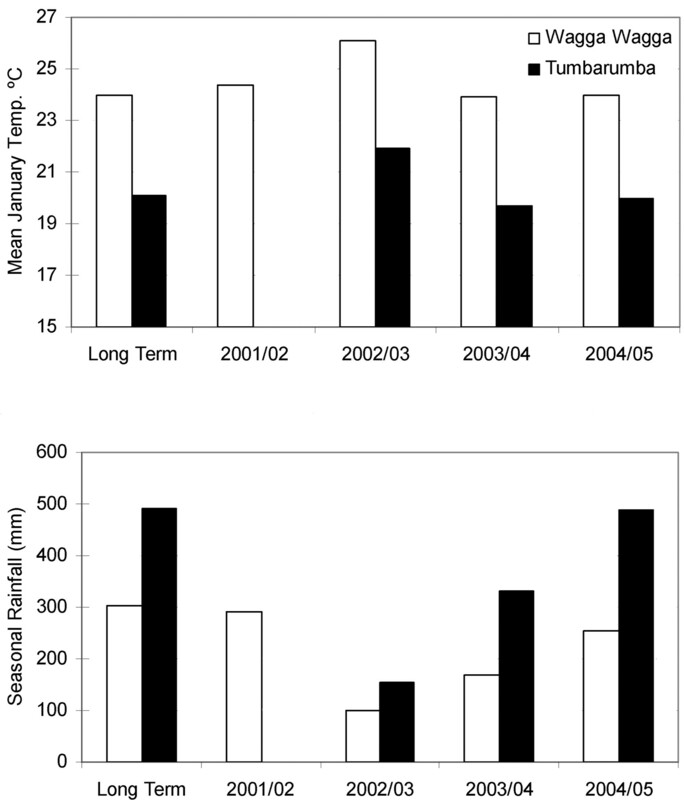 Mean monthly soil moisture tension measured at 20 to 100 cm under vines at Wagga Wagga (a) and Tumbarumba (b). Values represent averages for the 2002/03, 2003/04, and 2004/05 seasons. Vertical bars denote one standard deviation. Asterisks mark significant differences between treatments at p < 0.05. In each season over the experimental period, irrigation began early November at WW and late December at TR. After three experimental years at WW and two at TR, there were few treatment differences in soil composition at 40- to 50-cm soil depth (Table 1⇓). More phosphorus was determined in complete than in the other two treatments at TR, and at the same site, the soil pH was less acidic in bare than in complete and partial. Soil nitrate contents were very low and did not permit statistical data analysis. No differences among treatments were found for any other soil properties investigated. Soil composition at 40 to 50 cm under vines in December 2004 as affected by vineyard floor cover at two climatically distinct sites. In agreement with the climatic differences between the two sites (Figure 1⇑), the TR soil had more organic carbon in the 0- to 10-cm soil layer (mean 1.5%) than the WW soil (mean 0.8%) (Table 2⇓). Although organic carbon content in the 0- to 10-cm soil layer was not affected by the floor cover treatments, there was more organic C in the midrow (mean 1.3%) than under vines (mean 1%), regardless of site, treatment, or year. Nutrient content in petioles indicates that there was some effect of floor-management treatments on vine nutrient uptake (Table 3⇓). In 2003/04 and 2004/05, N at bloom was significantly less in complete than in bare (and in some cases partial) at both sites. This difference was also found in petioles collected at veraison at WW in 2003/04 and 2004/05 and at TR in 2004/05. Petiole nutrient content at bloom as affected by vineyard floor cover at two climatically distinct sites. In 2003/04, Cu at bloom was higher in partial than in the other treatments at both sites. 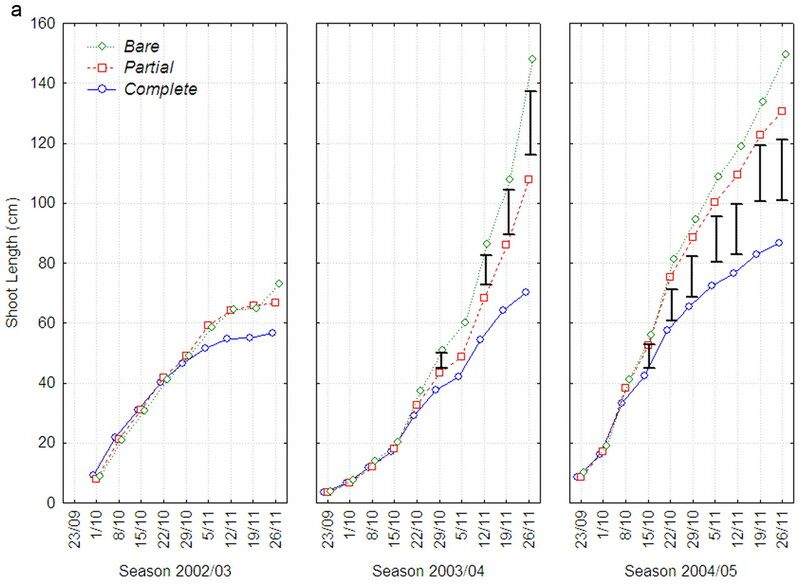 Mg was increased in bare in both seasons at WW and in 2003/04 at TR. Na was increased in complete at WW in 2004/05. Potassium at bloom was lower in complete than in bare at TR in 2003/04; however, it was higher in the same treatment compared to the other two at WW in 2004/05. In 2003/04 P was higher in bare than in partial. Sulfur was generally lower in bare than partial, which was found in petioles collected at bloom at WW in 2003/04 and at TR in 2003/04 and 2004/05, and those collected at veraison in 2003/04 (not shown). Vegetative growth and canopy architecture. In 2004/05, bloom occurred earlier in bare at TR, while at WW veraison was delayed in complete by 3 to 4 days in comparison with the other treatments (Table 4⇓). 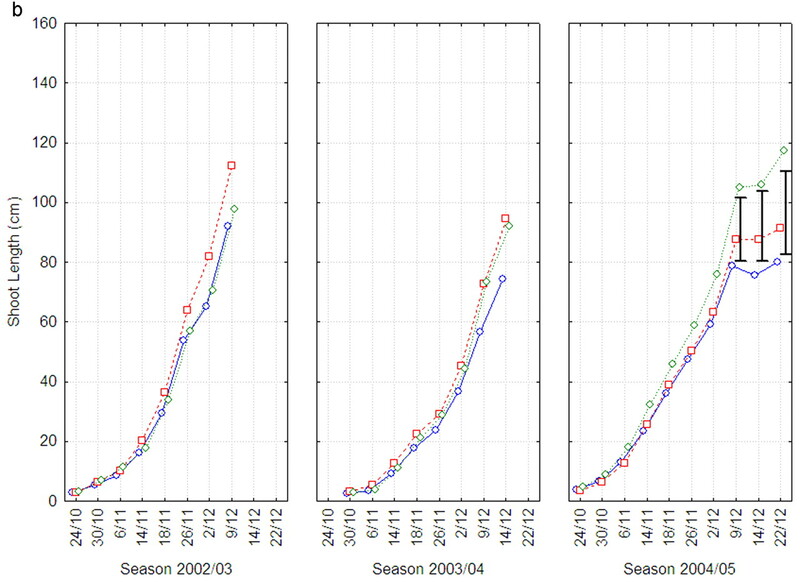 A strong effect of the floor-cover treatments on shoot growth was observed in 2003/04 and 2004/05, particularly in WW. At WW, shoot vigor of vines on complete was 1.1 cm/day over the budbreak-to-bloom period, whereas shoots on bare and partial grew considerably faster (1.6 and 1.5 cm/day, respectively, p < 0.05). However, early-season vigor was similar for all treatments in TR (1.0, 1.2, and 1.1 cm/day, respectively, for complete, bare, and partial). 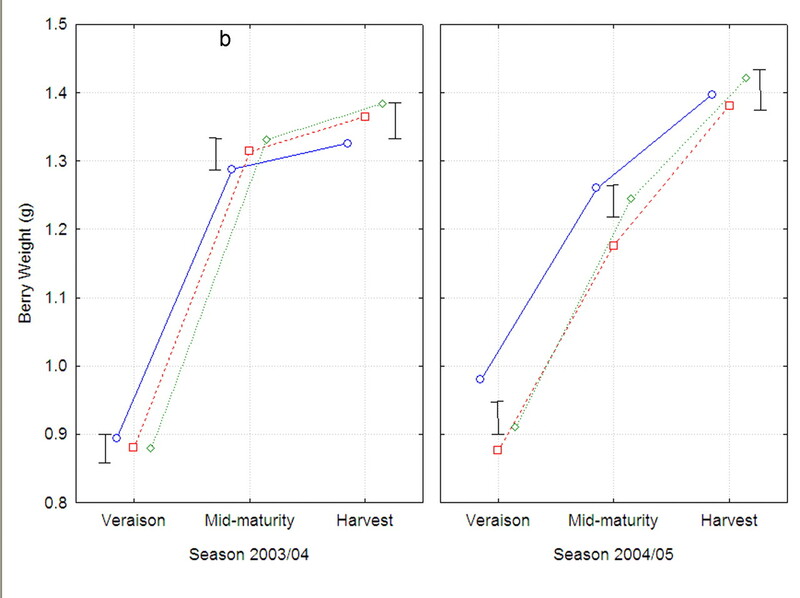 Phenological stages in the 2004/05 season as affected by vineyard floor cover at two climatically distinct sites. As a consequence of the reduced vigor, final shoot length generally decreased with increasing extent of floor cover (Figure 4⇓), a response also reflected in pruning weight (Figure 5⇓). These results indicate that there was a tendency for treatment differences in vegetative growth to increase over time at WW. Yield to pruning weight ratio (not shown) remained relatively constant over four experimental seasons. Shoot growth at Wagga Wagga (a) and Tumbarumba (b) over three growing seasons. Vertical bars denote LSD at p = 0.05 (shown where F test significant at p < 0.05). 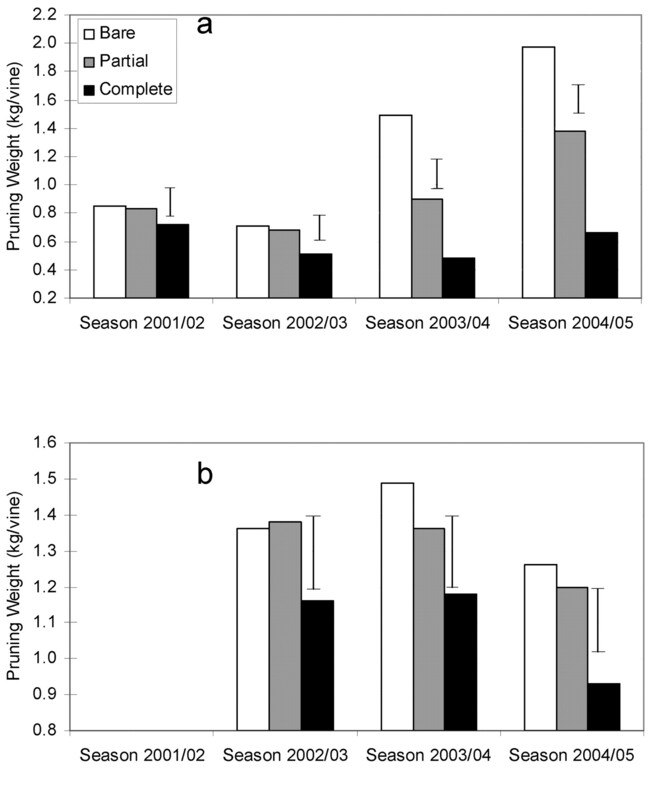 Changes in pruning weight over the experimental period at Wagga Wagga (a) and Tumbarumba (b). Vertical bars denote LSD at p = 0.05. While initially there were no treatment differences in canopy characteristics, in 2003/04 most observed attributes differed among treatments (Table 5⇓), particularly at WW where complete was different in all canopy attributes (percent gaps, leaf layer number [LLN], percent internal clusters, and percent internal leaves) compared with the other two treatments. Vines on complete had the fewest leaf layers, internal leaves, and clusters and the most canopy gaps, whereas vines on bare appeared to have the densest canopies. There were also some differences between partial and bare, with bare having a higher LLN and percent internal clusters than partial. Complete was also lower in LLN and percent internal clusters than the other two treatments at TR. Canopy point quadrate measurements as affected by vineyard floor cover at two climatically distinct sites. Significant treatment effects were observed in grape yield at harvest and in number of clusters per vine (Table 6⇓). No differences were observed at WW in the first two seasons. However, yield and cluster numbers were strongly affected by the applied floor-cover treatments in the third and fourth seasons and yield and cluster numbers were higher in bare than in complete. (There were no differences between partial and complete in cluster numbers in 2003/04). Over the first two seasons at TR there were no treatment differences, but in 2004/05 complete had a decreased yield and cluster number compared with the other treatments. The low number of clusters and a relatively low yield at TR in 2002/03 and 2004/05 can be related to damages incurred by frosts that occurred in this region in spring 2002 and 2004. Yield components as affected by vineyard floor cover at two climatically distinct sites. Berry weight decreased with increasing floor cover (Figure 6⇓), which was particularly noticeable at WW, where all differences among treatments observed at veraison, mid-maturity, and harvest were significant (p < 0.01). The fact that these differences were already present at veraison suggests that the impact of the treatments was most pronounced on early berry growth. The final berry weight at TR in 2003/04 was lower in bare compared with the other two treatments (p < 0.01). In 2004/05 berry weight was higher in bare compared with the other two treatments at veraison and midmaturity (p < 0.01), with no differences at harvest. Berry weight at Wagga Wagga (a) and Tumbarumba (b). Vertical bars denote LSD at p = 0.05. No differences in TSS at harvest were observed in the first three seasons of the experiment (Table 7⇓). In the fourth season, which was implemented at WW only, TSS was lowest in bare and highest in complete. Inconsistent differences in TA at harvest were observed in 2002/03 and 2004/05 at WW; corresponding differences in pH at harvest were also observed at the same site. At TR, complete had the lowest TA at harvest in 2002/03 and 2004/05, while partial and bare were the highest in these two seasons, respectively. There were no differences in harvest pH at TR in these seasons, although complete had the lowest pH in 2003/04. Fruit composition (total soluble solids, titratable acidity, and pH) at harvest as affected by vineyard floor cover at two climatically distinct sites. At WW in 2003/04, TSS differed among treatments at veraison, but there were no differences among treatments at midmaturity (data not shown). In 2004/05, treatments at WW were different at all examined stages of fruit ripening, with complete having higher TSS. At TR, floor covers did not affect TSS at any stage of fruit ripening. At WW in 2003/04, TA values differed among treatments at midmaturity and were lower in complete than in the other two treatments (data not shown). In 2004/05 berries differed in TA at this site at all sampling stages, with bare being higher than complete. The pH values at WW in 2003/04 differed only at midmaturity, with partial lower than the other two treatments (data not shown). In 2004/05 the pH values were higher in complete than the other two treatments at WW throughout the ripening period. In 2004/05 at TR bare was higher in pH at veraison and midmaturity. Increasing the extent of floor cover reduced the soil moisture content and increased the soil moisture tension (Figures 2⇑ and 3⇑). This effect varied with time of season, vineyard site, measurement position, and depth. Vines at TR were (and normally are) much less dependent on irrigation than those at WW, leading to the difference between sites. TR receives about 60% more seasonal rainfall and is several degrees cooler than WW, which would greatly reduce evaporative demand in addition to the extra moisture input. The increased depletion of moisture under the complete treatment at TR could therefore indicate increased root activity in these deeper soil layers to compensate for competition for water with cover-crop plants growing under vines. The general lack of difference between bare and partial in this respect (both treatments having no cover crop under vines) also points to the same conclusion. Root growth of vines competing with grass has been found to decrease (Müller et al. 1984) and to shift to deeper soil layers (Reimers et al. 1994) or to areas (such as under vine) free of grass roots (Morlat and Jacquet 2003). On the other hand, the increased vegetative growth at WW in bare apparently led to increased soil water uptake later in the season. The effect of floor covers on soil composition at the 40- to 50-cm depth was less obvious. TR soil pH decreased slightly under the floor covers and was correlated with petiole N (r = 0.77) and Mg (r = 0.72) at veraison. Although the floor covers had little effect on available plant nutrients in the soil, they generally led to decreased petiole nutrient status, an effect that was most pronounced for N and Mg and, somewhat less consistently, K. These results indicate that the lower nutrient status of vines growing in competition with floor covers was mostly due to decreased water availability and consequently decreased nutrient uptake, especially early in the season. A similar decrease in Chardonnay leaf blade N because of floor cover was reported (Tan and Crabtree 1990), but no change was found in P and K. Reduced petiole N, Ca, and Mg because of floor cover has also been reported for Merlot (Sicher et al. 1995). A permanent grass sward decreased the amino acid (especially arginine) concentration in Riesling juice compared with cultivated soil, which was attributed to reduced soil moisture and nitrate availability (Löhnertz et al. 2000). At both sites the complete treatment reduced vine vigor. Shoot length was generally correlated with petiole N content at bloom (at TR r = 0.66 in 2003/04 and r = 0.80 in 2004/05; at WW r = 0.86 in 2003/04 and r = 0.82 in 2004/05). Final shoot length was also correlated with the mean November (bloom to fruit set period) soil moisture tension at WW in 2003/04 (r = −0.75) and in 2004/05 (r = −0.87). Thus, the low soil moisture resulted in a striking decrease of vegetative growth in Chardonnay vines grown with sward at the warm dry WW site. Reduction in vine vegetative growth via reduced water availability associated with swards is well known. The use of sward-vine competition as a deliberate vine devigoration tool has been described (Lombard et al. 1988). Longer shoots were also found in Chardonnay grown on bare soil compared to sward (Tan and Crabtree 1990). A native grass cover crop reduced the pruning weight of drip-irrigated Merlot grown in the hot San Joaquin Valley of California by up to 40% compared with bare soil maintained by cultivation (Ingels et al. 2005). It was also reported that sward-vine competition for nutrients was more important in soils with ample water availability, while under drier conditions the soil moisture effect became predominant (Müller et al. 1984). Nevertheless, we cannot exclude the possibility that the greater influence of floor cover on vine growth in WW was partly due to a vine-age effect and partly due to the shallower soil at that site. Both of these factors may have resulted in a relatively smaller root system, which would have aggravated the effect of the pronounced climatic differences between the two sites. The remarkable sward-induced inhibition of vine growth in WW was accompanied by a comparable decrease in yield, which is similar to findings with Chenin blanc in South Africa (van Huyssteen and Weber 1980b) and with Merlot in Italy’s Trentino region (Dorigoni et al. 1991). The reduced number of clusters at WW (Table 6⇑) points to inadequate cluster initiation in complete and to a lesser extent in partial, perhaps the result of water stress at bloom and berry set. The lower berry number per cluster in complete (Table 6⇑) was associated with a markedly higher soil moisture tension in the same treatment (Figure 3⇑) during November, when bloom and berry set occurred at WW (Table 4⇑). Accordingly, the WW yield decreased with increasing mean soil moisture tension in November (r = −0.78 and r = −0.84, respectively for 2003/04 and 2004/05). Moreover, at WW in 2003/04 there was a strong relationship (R2 = 0.88, p < 0.001) of berry weight with November soil moisture tension and petiole-N at bloom. In 2004/05, berry weight at WW was more closely related to December soil moisture tension and petiole-N at bloom (R2 = 0.59, p < 0.05). Petiole N at bloom also correlated with cluster weight (r = 0.80) in TR 2004/05. These relationships emphasize the need for careful management of floor cover so that excessive competition can be eliminated during critical periods such as bloom, berry set, and the cell division stage of berry growth. At veraison in 2003/04 at WW, the first occurrence of advanced fruit maturity (smaller berries with higher solute concentration) was observed, presumably as a consequence of the drying effect of the increased floor cover. The 2004/05 results confirmed this effect at all observed stages of ripening. No such difference was observed at TR, where treatments were imposed one year later than in WW. A similar effect of floor treatment on TSS in two of three experimental years has been found elsewhere (Dorigoni et al. 1991, Egger et al. 1995). The increases in TSS with increased floor cover in later years of this experiment can be partly explained by the TSS response to previously mentioned changes in yield and possibly berry size. Correlation coefficients between yield and TSS at harvest at WW were r = −0.40 in 2003/04 and r = −0.69 in 2004/05. However, this relationship may have been caused by treatment effects on both these variables, since there was no such correlation within floor cover treatments. At TR there was also a correlation between TSS and yield in 2003/04 (r = −0.34) and in 2004/05 (r = −0.40). In addition, denser canopies at TR were associated with lower TSS: in 2002/03 LLN and percent internal leaves were correlated with TSS at harvest (r = −0.69 and r = −0.70, respectively). These relationships imply that the increased floor cover led to lower soil moisture, thus causing more open canopies, lower yields, and increased fruit maturity. The decreased cost of not using herbicides—less erosion and dust, all associated with the complete floor cover—would likely not offset the decrease in grape yield in a hot and dry climate. That would hold true even when the gain in fruit maturity is taken into account, although it would depend on the end use of grapes and the pricing regime. The relative cost of the complete floor cover may be different in a cooler, more humid climate. In hot and arid environments, regardless of the present results, it would be too simplistic to recommend maintaining bare soil with herbicides as a sustainable option, as there could be other unintended negative effects associated with the use of herbicides. As a part of the same research study reported in this paper, a negative effect of herbicides on the presence of soil microorganisms was observed (Whitelaw-Weckert et al. 2004). There are several approaches to overcome a reduction in grape yield associated with the transition from a clean vineyard floor to a partial or total floor cover. Mowing, for example, generally decreases water use by cover crops (Skrotch and Shribbs 1986). Species that are not characterized by intensive spring growth might be preferred as cover crops (Skrotch and Shribbs 1986), as well as summer dormant species. The choice of floor covers can be further expanded by using mulches, as they provide the highest soil moisture conservation of all floor covers (van Huyssteen and Weber 1980a, Skrotch and Shribbs 1986). Unwanted effects of the sward-vine competition may also be reduced by using drought-tolerant grapevine root-stocks. Rootstocks were been found to vary in their ability to take up and use soil nutrients in vines growing with a permanent complete floor cover, which led to differences in yield and fruit composition (Keller et al. 2001a,b). Changes in irrigation management also could mitigate some of the perceived negative aspects of the use of floor covers while preserving the positive aspects. For instance, irrigation could be initiated earlier in the season or irrigation water amounts could be increased during critical stages of development (e.g., bloom/fruit set). In our experiment, there was little effect of treatment on the content of organic carbon in the topsoil over three years (Table 2⇑). The ability to increase soil organic matter content is vital for a successful implementation of herbicide-free viticulture (Perret and Koblet 1985). Over a 15-year period, a sward increased organic matter in vineyards of the Loire Valley in France (Morlat and Jacquet 2003) and (after three years) the Adige Valley in Italy (Pinamonti et al. 1996). An increase in soil organic matter was also achieved in the semiarid Brazilian Sao Francisco River Valley by using green manure over a six-year period (Faria et al. 2004). These findings indicate a need to study long-term effects of vineyard soil management systems. For the systems approach to work, enough time is required to achieve ecological balance (Ingels 1992). Water and nutrient availability to the vines was decreased by the increased floor cover. That reduction in soil moisture was associated with a considerably diminished nutrient (particularly nitrogen) uptake. The extent of this effect was site-dependent, whereby sward-vine competition for water was more severe in the dry, hot WW climate compared to the milder TR climate. Floor covers altered canopy architecture and reduced vine vigor and yield at both sites but only after treatments had been imposed for two or three years. Prior to the fourth experimental season at WW, treatment effects on fruit composition were minor compared with those on growth and yield formation; in that season, however, fruit ripeness was improved with increasing floor cover. Several vineyard floor management strategies are available to reduce the unwanted effects of sward-vine competition in dry warm areas, particularly during the most sensitive stages for yield formation. With proper mitigation, floor covers can provide a viable option for accomplishing long-term environmental sustainability, while reducing chemical inputs and achieving economic yields and favorable fruit composition. Acknowledgments: This study was supported by Australia’s grapegrowers and winemakers through their investment body, the Grape and Wine Research and Development Corporation, with matching funds from the Australian Government. National Wine and Grape Industry Centre staff Emily Rouse, Rhonda Smith, Andrew Smith, Leo Quirk, and Sylvie Sicard are thanked for their valuable technical assistance in the field and laboratory. We are grateful to CSU Winery manager Andrew Drumm and Mannus Wine Estates former manager Mark Verheyden for allowing access to their vineyards. Many thanks to Janet Wild of New South Wales Department of Natural Resources for providing her soil profile report. Boller, E.F., and U. Remund. 1986. Der Rebberg als vielfältiges Agro-Oekosystem. Schw. Zeitschrift Obst-Weinbau 122:45–50. Egger, E., L. Raspini, and P. Storchi. 1995. Vineyard soil management: Research results from central Italy. Supplem. 3–8. Vignevini 22:12. Dorigoni, A., L. Sicher, and A. Monetti. 1991. Einfluss verschiedener Bodenpflegesysteme auf die vegetative und generative Leistung der Rebe: Ein Vergleich zwischen kontrollierter Begrünung, Bodenbearbeitung und chemischer Unkrautbe-kämpfung. Wein-Wissen. 46:108–114. Faria, C.M.B., J.M. Soores, and P.C.S. Leao. 2004. Green manuring grapevine with legumes in the submiddle Sao Francisco River Valley. Rev. Brasil. Cien. Solo 28(4):641–648. Ferrini, F., G.B. Mattii, and P. Storchi. 1996. Effect of various ground covers on berry and must characteristics of Sangiovese wine grape in the Brunello di Montalcino area. Acta Hortic. 427:29–35. van Huyssteen, L., and H.W. Weber. 1980a. Soil moisture conservation in dryland viticulture as affected by conventional and minimum tillage practices. S. Afr. J. Enol. Vitic. 1(2):67–75. van Huyssteen, L., and H.W. Weber. 1980b. The effect of selected minimum and conventional tillage practices in vineyard cultivation on vine performance. S. Afr. J. Enol. Vitic. 1(2):77–83. Ingels, C.A. 1992. Sustainable agriculture and grape production. Am. J. Enol. Vitic. 43:296–298. Ingels, C.A., K.M. Scow, D.A. Whisson, and R.E. Drenovsky. 2005. Effects of cover crops on grapevines, yield, juice composition, soil microbial ecology, and gopher activity. Am. J. Enol. Vitic. 56:19–29. Keller, M., M. Kummer, and M.C. Vasconcelos. 2001a. Reproductive growth of grapevines in response to nitrogen supply and rootstock. Aust. J. Grape Wine Res. 7:12–18. Keller, M., M. Kummer, and M.C. Vasconcelos. 2001b. Soil nitrogen utilisation for growth and gas exchange by grapevines in response to nitrogen supply and rootstock. Aust. J. Grape Wine Res. 7:2–11. Lennartz, B., X. Louchart, M. Voltz, and P. Andrieux. 1997. Diuron and simazine losses to runoff water in Mediterranean vineyards. J. Environ. Qual. 26:1493–1502. Löhnertz, O., B. Prior, M. Bleser, and A. Linsenmeier. 2000. Influence of N-supply and soil management on the nitrogen composition of grapes. Acta Hortic. 512:55–64. Lombard, P., S. Price, W. Wilson, and B. Watson.1988. Grass cover crops in vineyards. In Proceedings of the Second International Symposium for Cool Climate Viticulture and Œnology. Smart et al. (Eds. ), pp. 152–155. New Zealand Society for Viticulture and Œnology, Auckland. Morlat, R., and A. Jacquet. 2003. Grapevine root system and soil characteristics in a vineyard maintained long-term with or without interrow sward. Am. J. Enol. Vitic. 54:1–7. Müller, W., E. Rühl, and H. Gebbing. 1984. Untersuchungen über die Wechselwirkungen zwischen Rebe und Begrünungspflanzen. Wein-Wissen. 39:3–15. Perret, P., and W. Koblet. 1985. Soil management in viticulture. Schw. Zeitschrift Obst-Weinbau 121:147–152, 178–182, 209–212. Pimentel, D., H. Acquay, M. Biltonen, P. Rice, M. Silva, J. Nelson, V. Lippner, S. Giordano, A. Horowitz, and A. D’Amore. 1992. Environmental and economic costs of pesticide use. BioScience 42:758. Pinamonti, F., M. Stefanini, and A. Dalpiaz. 1996. Soil management effects on nutritional status and grapevine performance. Wein-Wissen. 51:76–82. Powles, S.B., D. Lorraine-Colwill, J. Dellow, and C. Preston. 1998. Evolved resistance to glyphosate in rigid ryegrass (Lolium rigidum) in Australia. Weed Sci. 46:604–607. Reimers, H., B. Steinberg, and W. Kiefer. 1994. Ergebnisse von Wurzeluntersuchungen an Reben bei offenem und begrüntem Boden. Wein-Wissen. 49:136–145. Sicher, L., A. Dorigoni, and G. Stringari. 1995. Soil management effects on nutritional status and grapevine performance. Acta Hortic. 383:73–82. Skrotch, W., and J.M. Shribbs. 1986. Orchard floor management: An overview. HortScience 21:390–394. Smart, R.E. 1988. Shoot spacing and canopy light microclimate. Am. J. Enol. Vitic. 39:325–333. Tedders, W.L. 1983. Insect management in deciduous orchard ecosystems: Habitat manipulations. Environ. Manage. 7:29–34. Tesic, D., D.J. Woolley, E.W. Hewett, and D.J. Martin. 2002. Environmental effects on cv Cabernet Sauvignon (Vitis vinifera L.) grown in Hawke’s Bay, New Zealand. I. Phenology and characterisation of viticultural environments. Aust. J. Grape Wine Res. 8:15–26.